The relatively benign starting hole at Kearney Hill gives the golfer an introduction to the day’s wind direction, which will generally determine how the round will go. One of the first Pete Dye collaborations with his son, P.B. 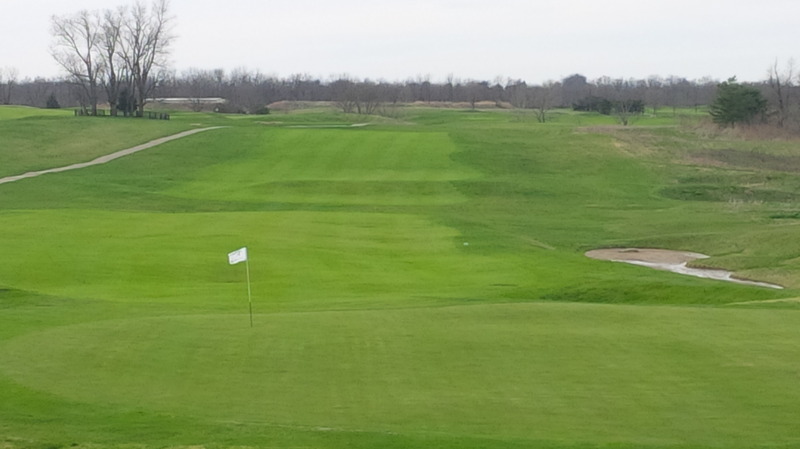 Dye, was Kearney Hill Golf Links here in Lexington, Kentucky. 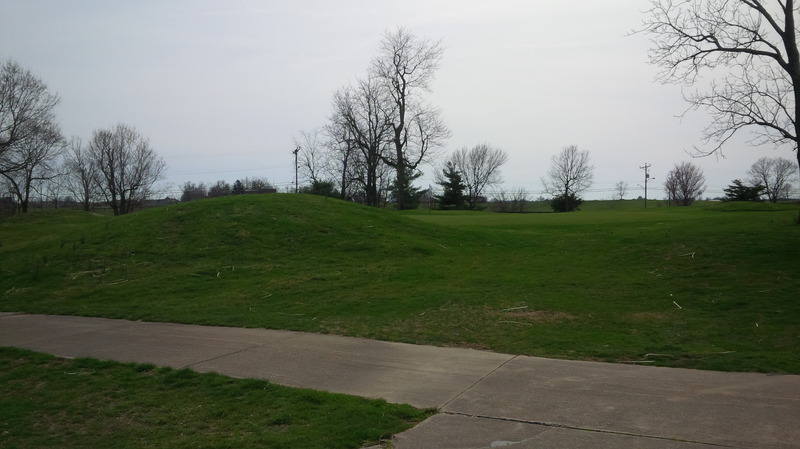 It has been the crown jewel of municipal courses in Central Kentucky since in opened in 1989. 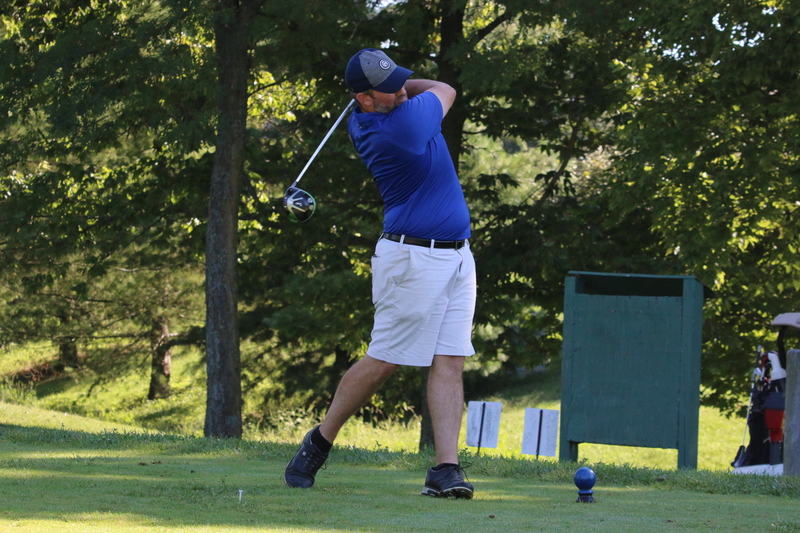 Despite hosting some lofty and prestigious tournaments over the years, Kearney Hill remains a golf course that the average amateur can enjoy playing at a reasonable rate. 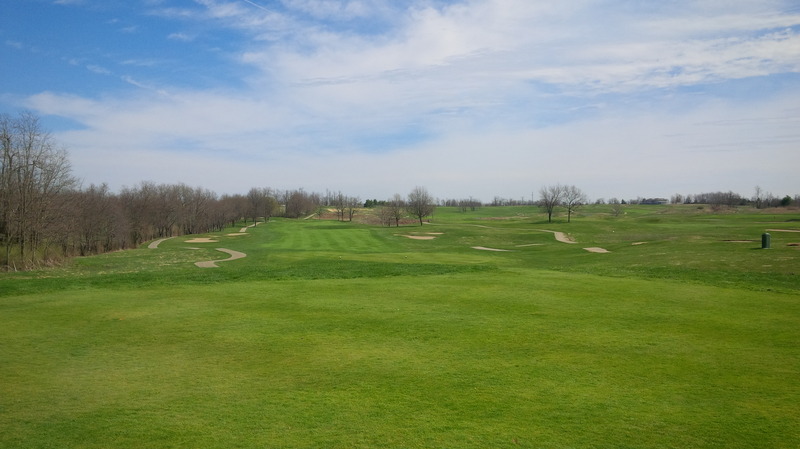 Located on 211 acres of rolling hills and gentle plateaus in northern Fayette County, Kearney Hill looks like a beautiful golf course was carved from an Excitebike rally tract. Though bordered by Interstate 64 to the south and a Norfolk Southern rail line to the east, the course lies on the rural outskirts of Lexington. 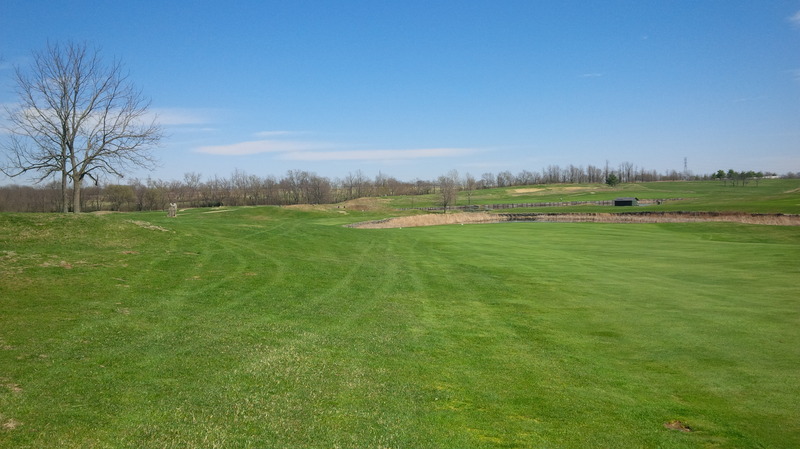 Urban sprawl has not yet made it to Kearney Hill’s doorstep, and it is one of the few courses in Kentucky truly unencumbered by houses. 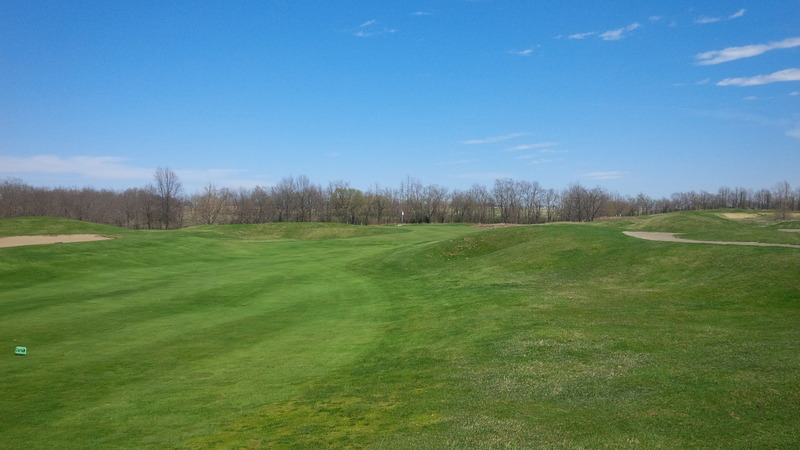 Finally spring is upon us here in the Bluegrass, as Kearney Hill’s bent grass tees, fairways, and greens finally sprung to life in early April. The story of how Kearney Hill came to exist is actually worth recounting. Lexington’s nearby Griffin Gate Golf Club played host to a Senior PGA Tour event, and the City of Lexington wanted a venue that would attract future tournaments and championships to Central Kentucky. 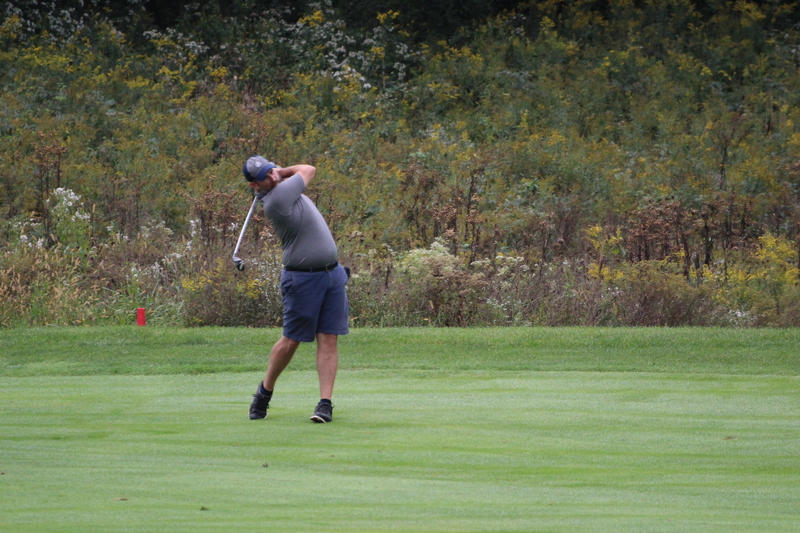 The task involved building a course that would be welcoming to local amateur golfers of all skills, as well as attract the highest caliber players from all over the region. Legendary Lexington golfer Johnny Owens led the effort to develop a high-end, municipal golf course in Lexington. Additionally, as Owens contacted then retained Pete Dye and his son, P.B. Dye, to lead the design and construction of just such a course. Kearney Hill incorporates 71 bunkers, many of which a deep, steep faced hazards more akin to the Scottish lowlands than the American Mid-South. The Dyes accomplished their objective in full. 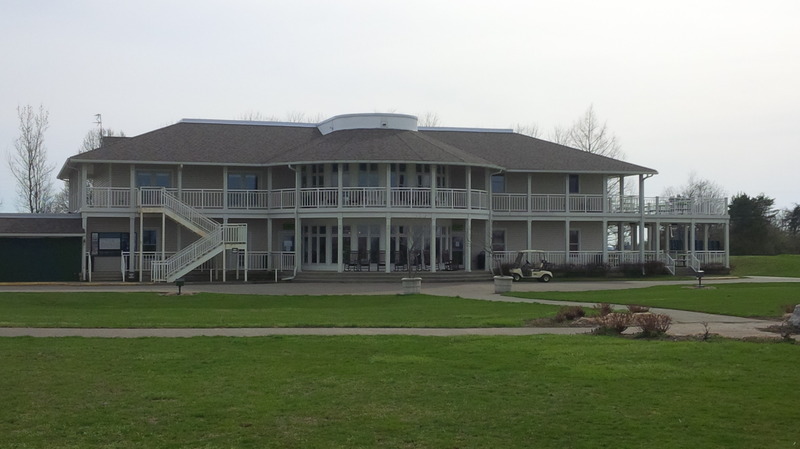 Kearney Hill played host to a Senior PGA tournament from 1990 through 1997, providing a much-needed boon to the Central Kentucky golfing community and economy at large. Having just played Harbour Town one month prior, Kearney Hill provides an example of Pete Dye’s more contemporary work, standing in stark contrast to many of Dye’s earlier design principles. Whereas Harbour Town is routed through tall stands of pine trees with tiny greens requiring precise drives and approaches, Kearney Hill is a wide open expanse leading to humongous greens. There are very few trees in play, giving credence to the “Golf Links” name of the course. 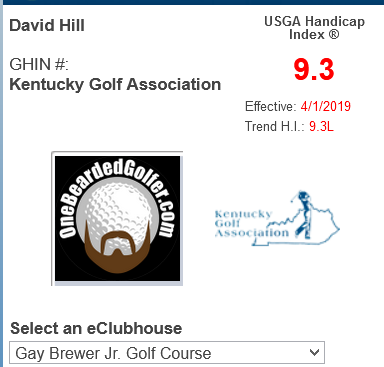 Kearney Hill sits upon one of the highest points in Fayette County, much less the entire Bluegrass Region, so wind is always an important factor, if not the primary determinant of scoring and strategy. Unfortunately, the Dye’s trademark railroad ties haven’t been maintained at Kearney Hill, and without replacement soon may rot into the lake they contain. Though it’s not the first characteristic that comes to mind, there is prolific and substantial mounding on most of the course. Several fairways and most of the greens are bordered by mounds on at least one side, though strategically, they feel less important than the wind and the bunkers. The course contains very little water in relation to its total acreage. However, the Dyes got maximum bang for their buck out of the two man-made lakes located in the center of the golf course. The two lakes border and play an important strategic role on four holes, including holes 15 through 17 of the closing stretch. 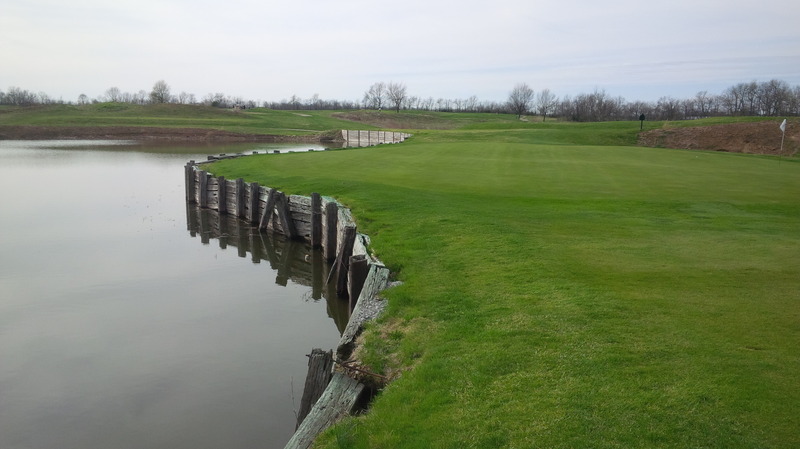 The upper lake incorporates the quintessential Dye design feature of using railroad ties to strengthen the vertical walls above the water. Standing on the 16th tee, green, or fairway, the savvy golfer would recognize the lake as vaguely familiar, as if they’d seen if before at Harbour Town or TPC Sawgrass. The lengthy par 5 7th hole provides one of the few opportunities steal a stroke from the course without significant risk of giving a stroke back. As mentioned above, Kearney Hill formerly hosted several very prestigious tournaments, which translated into big money for the course and the city. Thus, the course was kept in immaculate shape for a municipal golf course. The first several years I played it, in the late 1990’s, the course was cart path only full-time in order to preserve the pristine bentgrass fairways and mounding. 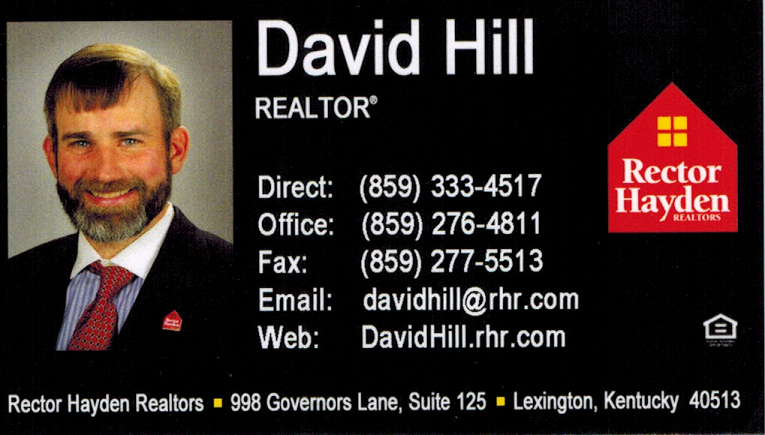 However, once the Senior Tour and Celebrity Golf tournaments pulled out of Lexington after 2001, the loss of the excess tournament funding for Lexington, and more specifically the Division of Parks and Recreation, meant a lot less money for the golf course. 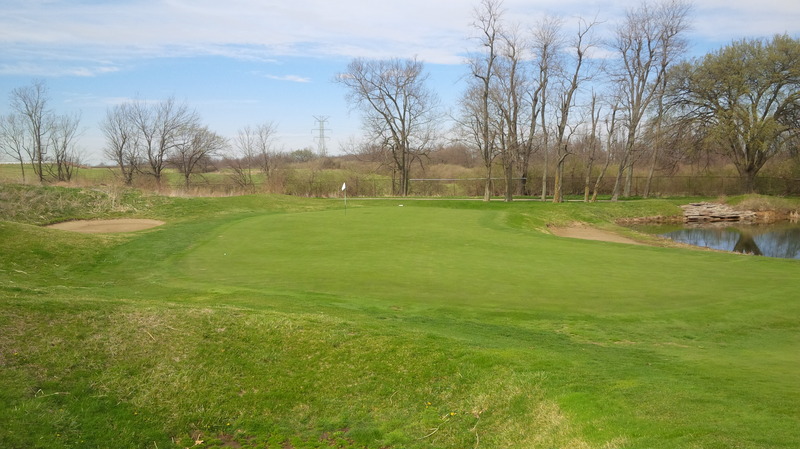 Less money meant the once immaculately maintained golf course regressed back toward the mean. The mounds around the 10th green act more as a backstop than a scoring impediment; you’d have to be almost 25 yards off-line to face playing over the mounds. Chemical budgets were reduced and capital improvements haven’t been made at rate that would maintain the course’s top-shelf conditioning. Unfortunately, the lack of capital spending has compounded each subsequent year, and it shows. The green complexes are not at the pristine, championship level they once were. I don’t know when the greens were last aerated, but they had not fully recovered by this particular sunny Sunday afternoon. Despite being top-dressed days or weeks earlier, putting at Kearney Hill was like putting across an old Plinko board from The Price is Right. 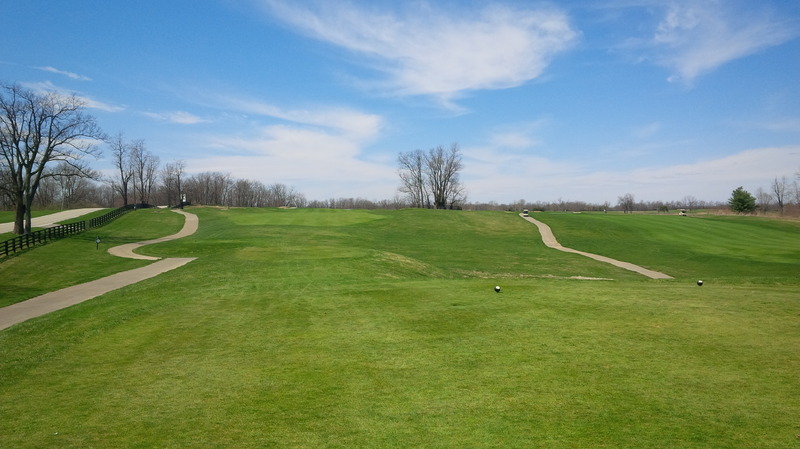 Don’t get me wrong, the tees and fairways were in great early season condition. 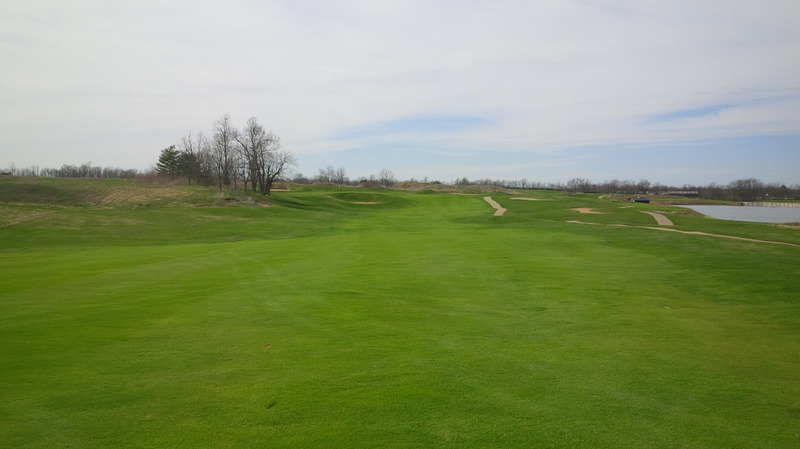 The rough had not been mowed yet this year, but it had begun greening up and was completely playable and visually complimentary to the rest of the course. With water right, bunkers short and long, perhaps the deepest green at Kearney, and some of the most strategically important mounds on the course, the par 3 12th hole is nothing but trouble. But notably, the railroad ties are rotting and giving way around the lakes, suffering under what appears to be years of neglect. The once Tour quality bunkers are brown from years of topsoil and clay infiltrating the underlying sand. If left unattended, eventually Pete Dye’s signature on the Kearney Hill may well disappear into the memories of the golfers fortunate enough to play it at its peak former glory. 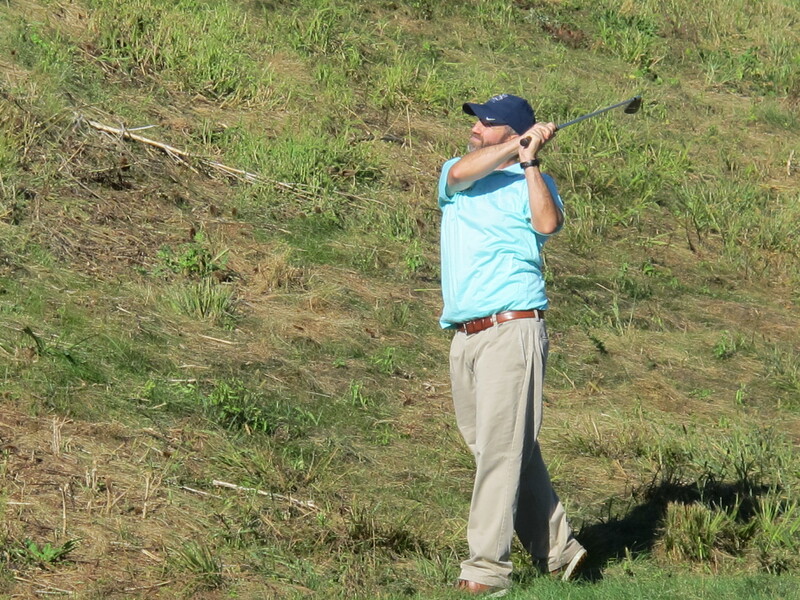 Nonetheless, Kearney Hill remains a great golfing challenge. From the back of the 5 sets of the tees, the course is formidable, especially if the wind is blowing. The massive greens slope gently as a general rule instead of suffering any artificial feeling tiers. Pin placement upon the larger greens under specific wind conditions can dictate a two to four club difference to hit a good approach. The par 5 14th hole is one of several signature holes at Kearney Hill, requiring thought, courage, and precision to score well. It was soul-warming to get out and enjoy some warm sunshine in Central Kentucky, finally. I didn’t play particularly well, but the driver was working all day, so I could enjoy the round even though the scoring (read: putting) was pitiful. My golf lessons are starting to truly pay dividends. If I can simply remember to rotate my hips as I’ve been instructed, rather than revert back to my “Latin Hips” slide move of yesteryear, I’ve gained accuracy, consistency, and yardage off the tee, which usually is determinative of if I’m going to enjoy my round or get frustrated. A look back down the par 5 18th hole from the plateau between the green and the clubhouse. I did end on a good note, finally breaking through for a birdie on the 18th hole. I bombed a drive into the wind on 18, followed by a smashed 3 wood up the hill to about 30 yards from the front right hole location, from which I got up and down. At its best, Kearney Hill is a gem of a golf course. It’s not just a collection of good and great holes, but a really strong golf course. I would argue that elevation change plays too prominent role to support a true “Links” moniker, but its wide open layout allows the wind to dictate play in the manner consistent with a links-style course. 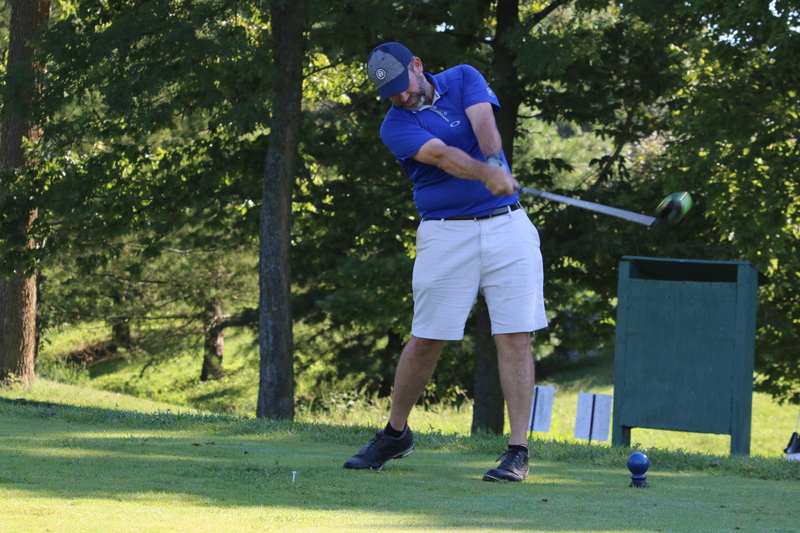 Fun fact: Kentucky native and PGA Tour professional Josh Teater holds the Kearney Hill course record, shooting a 61 in the 2001 Lexington Open. Kearney Hill remains a wonderful golf course. It is devoid of houses, and though largely treeless, it is designated as a Certified Audubon Cooperating Sanctuary, supporting the initiative to protect many natural habitat areas and varied bird species. The course is fairly unique amongst its Central Kentucky contemporaries, and a course I don’t think I will ever tire of playing. ← Apocrypha or Apocalypse? The Wife is taking up Golf. Great assessment of the course. Too bad about the lack of funding, it looks like a great place to play. Glad to hear your lessons are paying off. You would be surprised, or not, how many players take lessons and not use the advice. The Masters today should be exciting!